Northampton Chess Club is Northamptons oldest chess club, though currently is a match play only club. They play in the Bedfordshire League and Cup competitions. Due to circumstances beyond the clubs control, the club was mothballed for the 2015/16 season, and many of its members migrated to Chess Mates Northampton. It is the intention of Northampton Chess Club to once again become a separate entity, and host its own club nights (Not Tuesdays). If you have a venue and are interested in hosting Northampton Chess Club let us know through the website. 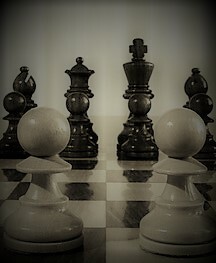 Chess has been played in England for well over two hundred years but it was not until the middle of the 19th Century that we saw chess clubs being set up in the larger towns and cities. In September 1875 the St. Giles’s Young Men’s Society formed a chess club with the Rev. C.J. Langley as its President. There were later changes in its name, firstly to Northamptonshire Chess Club and then to its present name of Northampton Chess Club. At the end of the 19th Century Mr. Henry E. Atkins came to Northampton College to teach mathematics and joined the Club. He was at the time the British Amateur Champion and later went on to win the British Championship nine times. He maintained links with the Club for over 30 years, either by playing simultaneous matches in Northampton or by adjudicating on chess games. The Club has won the Northamptonshire League and Cup on numerous occasions and over the years has provided players for both the Northamptonshire and Bedfordshire County teams. Like most chess clubs the fortunes of the Northampton Club have fluctuated with the game falling into and out of popularity. The club has just gone through a difficult period, but with a new steering committee are looking to regain its position as one, if not the best, of the county’s clubs. However when playing matches the home match night is Wednesday at the same venue. At Northampton Chess club we are in the fortunate position not to currently have to charge a membership fee. However the club does currently meet on an adhoc basis as many members already meet on Tuesday Nights along with Chess Mates. each year. You can do this by going to the ECF Website. You will only need to pay one subscription to the ECF regardless of how many teams / clubs you play for or how many tournaments you enter.